We keep these ingredients on hand for impromptu visits and occasional late meetings. Add wine and you can have a "complete meal!" Notes: When entertaining, I double this recipe and make in batches using four (8-oz) boxes of cream cheese each. Please read notes about ingredients below. You may have to order Sun Brand Original Major Grey's Mango Chutney, however, I think it is integral to the outcome of this recipe. I've tried other brands that try to imitate it and, for this recipe on every occasion, I've been less pleased with the results. Merwanjee Poonjiajee & Sons Private, Limited, established in the year 1876, manufactures and supplies the Sun Brand from an old family recipe. According to the company's web site at chutney.net, the mango chutney and curry powder made under its "Sun Brand" were among the first of their kind to be exported from India. In 1986, Merwanjee Poonjiajee & Sons Pvt. Ltd. set up manufacturing facilities in the USA. It appears the company conducts business simultaneously from Mumbai, India, and though its American sales and distribution agent, World Finer Foods. 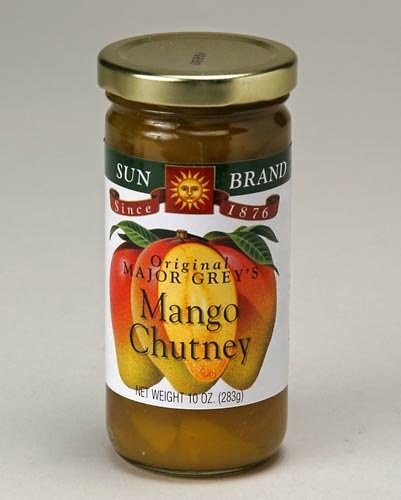 Having emphasized its importance, Sun Brand Original Major Grey's Mango Chutney is available in some retail stores (check here for locations near you) and via the company's online store (USA sales here) and Amazon. I use Costco's store brand Kirkland Signature™ Crumbled Naturally Smoked 100% Real Bacon. The 20-oz bag is very economical, and you can store what you don't use in the refrigerator in the handy zip-loc bag. Did you know Nabisco began manufacturing Triscuits in 1903 in Niagara Falls, NY? Not that this dish will linger, you may tightly cover and refrigerate any leftovers for several days. About two (2) hours before serving, place cream cheese block(s) in center of serving platter. Add layer of bacon bits, then chopped green onions. Cover and refrigerate the Mango Cream Cheese several hours for the flavors the mingle. Bring to room temperature before serving with Triscuits.